In May 2008 I wrote my Clothes Moths Attack! post about my attempts to get rid of clothes moths in a friend’s home. It soon became clear that many other people were hard at work battling the seemingly indestructible clothes moths as many comments after comment started to roll in. After receiving over 100 reader stories about your attempts to get rid of clothes moths I thought I should put some of the collective wisdom together and produce a page of tips for getting rid of clothes moths (although much of this advice will apply to other types of moths as well). Common clothes moths (tineola bisselliella) appear in the Spring, Summer and Winter. 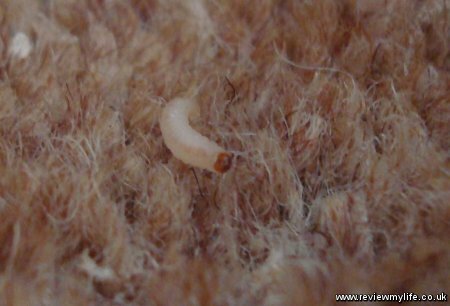 The larvae which look like white maggots eat your carpets or clothes. You’ll see them crawling in the carpets, up walls, and over your fabrics. They later turn into flying moths. The flying moths don’t cause any direct damage to fabrics, but they can each lay many 10’s of eggs. Their numbers can multiply very quickly and you can soon end up with a very bad infestation. If you already have clothes moths you are going to have to work to keep the numbers down. If the infestation is bad this could turn into a war! Vacuum the carpets regularly. Especially in any areas that you know the moths gather, such as under the bed, in quiet areas of the room, and around the skirting boards. Immediately kill any live moths or larvae that you see. The larvae will eat your clothes and carpets, and the flying moths will lay eggs. Neither is good to have around! Keep doors, windows and cupboard doors shut. You want to make it difficult for them to move around. 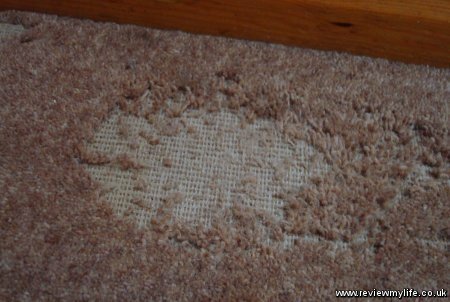 If the moths are eating the carpets then either remove the carpets completely, or replace wool carpets with synthetic ones. Fill in small gaps around the walls, floorboards, and cupboards. You want to reduce the amount of places the moths have to hide, feed and lay their eggs. Further reduce the number of places that moths can hide themselves or their eggs by keeping your home tidy. They love dark undisturbed areas under the bed, or behind junk that you may leave on the floor. If your home stays uncluttered and clean there are fewer places for them to go. Keep windows shut so the moths can’t get in. Consider putting an insect screen over windows that you regularly open. Open curtains and let as much natural light into the rooms as possible. Clothes moths seem to prefer it when it is darker. Don’t leave clothes or other natural fabrics in the open unless necessary. Keep the doors of clothing cupboards and wardrobes shut. Ideally they should be sealed shut so that a live moth or larvae can’t crawl through the gaps. You could make modifications to your wardrobes using rubber strips (e.g. like the ones for excluding draughts from windows) so that they have a near air tight seal when closed. Vacuum regularly as stated in the daily tips. A vacuum cleaner with a rotating brush in the head may be better than a suction only vacuum cleaner at dislodging eggs that are in the carpet. Store fabrics and clothes in sealed wardrobes or behind sealed cupboard doors. If you aren’t going to wear certain natural fibre clothes for a while put them in one of those vacuum bags so there is no way for any insect to get in them. If you have to store rugs then roll them up with some moth balls inside. If you suspect that an item of clothing may have got moth eggs in it you can put it in the freezer for three days to kill the eggs. Or alternatively give the item a hot wash (if it is suitable for hot washing). Dry cleaning may help to remove the moth eggs from more delicate clothing items. Use moth balls or lavender moth repelling scents in the wardrobe to reduce the chances of them going near the clothes. Get rid of old clothes that you don’t need or aren’t going to wear again. If you keep unnecessary clothes lying around you are only increasing their potential food supply. You have a number of options for killing moths and their eggs in the home. Some are free and other will cost money. Sweep or vacuum up any lose eggs. Use moth traps or moth killer strips to catch ones that are flying around. Use direct moth insecticide sprays on the moths or eggs to try to kill them. I’m not convinced that the consumer poisons are very effective on the clothes moths eggs – they seem fairly indestructible :( If you do try them the most effective thing seems to be to spray the area, wait a few days and spray again, and then keep repeating. Moth balls, cedar wood balls, lavender smelling fragrances, or moth killing hanging units can be used inside cupboards and wardrobes to keep moths away. Fumigation kits are available which release a poisonous gas into the room. I’m sceptical about their effectiveness – they may kill some adult moths, but I doubt they do much harm to the eggs. Here are some more links to moth killing products on Amazon.co.uk and Amazon.com. If your moth prevention and elimination attempts aren’t working you may have to call in the professionals. This is where you may end up paying big money. First you might want to check in your lease if you or your landlord is responsible for pest problems. If the landlord is responsible for getting rid of pests, and doesn’t then you may well be able to claim some form of compensation off him for damage to your clothes or fabric items. You might also want to try contacting your local authority to see if they have a free or cheap professional moth extermination option. If not you could end up spending hundreds of pounds or dollars to call someone in. If you do call in the professionals make sure they give you some kind of guarantee that if the moths aren’t eliminated they will come back to deal with the problem again. You may well need two or three (or more!) visits. If the infestation is very well established then multiple visits may not be effective. For example if the eggs are deeply embedded in carpets or floorboards then it is unlikely that any professional spraying will get rid of 100% of the eggs. You may need to do something more structural (removing carpets, filling gaps) to get rid of them. Move out to a new home. You wouldn’t be the first person to abandon a home because of moths. However it you do this there is a high risk that you will transport the eggs to your new place in your clothes and fabrics. Do thoroughly wash and seal all clothes away so you can try to eliminate the chances of transporting them to your new home. And when you arrive at your new home be vigilant for signs of new moths. Deal with them as soon as you see them so they don’t spread. 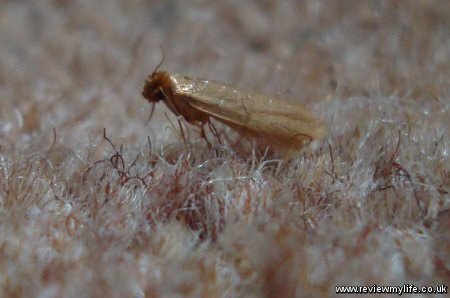 There are 150 comments and reader stories on my previous Clothes Moths Attack!. There is some great reader advice amongst those comments. I’ve had to close that post for new comments as it was getting too big! But please do continue to share your stories and tips on this page instead.